In late 2009 I visited a supplier which had been placed on containment for poor quality. (Due to the severe recession, travel budgets were cut and the ability to engage this supplier directly was delayed by over a year.) They were constantly fighting fires and were never able to get into a proactive mode where they could identify quality risks prior to quality problems occurring. For a long time we had an endless cycle of: quality problem – corrective action – problem resolved. Every time one problem was resolved another one came to attention. The supplier had put together a six sigma team together and over the course of several months they were able to get many of the quality problems fixed. However, when I arrived at their plant to verify the improvements and lift the containment I realized that there was still plenty of work to be done. By just walking and observing it was easy to identify areas of risk. I handed out sheets of lined paper and asked the six sigma team to follow me to the floor. We went to the first station (which was an injection molding process) and asked them to stand and watch the operation for 30 minutes and write down anything they thought could be improved. We did this for an entire afternoon on several key processes, and by the end of the day we sat down to compare notes. As simple as this activity sounded, by the looks of “I can’t believe we never thought of that” on their faces I knew that I had given them a breakthrough tool. They found simple yet breakthrough fixes to problems they were having trouble identifying just because they weren’t observing. I credit one of my mentors, Ken Martin, for introducing me to this basic, but useful tool when he stressed the importance of observing. 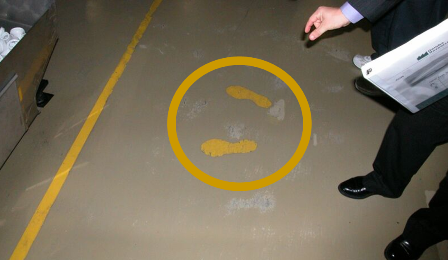 In my later years I learned that a famous Toyota mentor and executive, Taiichi Ohno, used to draw a circle on the ground and tell people to stand in it and observe a process for hours. Posted on Wednesday, January 27, 2010 by George R.